The disability of blindness is a learned social role. The various attitudes and patterns of behavior that characterize people who are blind are not inherent in their condition but, rather, are acquired through ordinary processes of social learning. 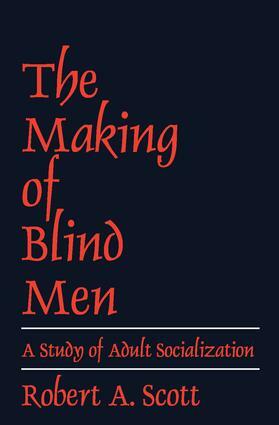 The Making of Blind Men is intended as a systematic and integrated overview of the blindness problem in America. Dr. Scott chronicles which aspects of this problem are being dealt with by organizations for the blind and the effectiveness of this intervention system. He details the potential consequences of blind people becoming clients of blindness agencies by pointing out that many of the attitudes, behavior patterns, and qualities of character that have been assumed to be given to blind people by their condition are, in fact, products of socialization. As the self-concepts of blind men are generated by the same processes of socialization that shape us all, Dr. Scott puts forth the challenge of reforming the organized intervention system by critically evaluating the validity of blindness workers' assumptions about blindness and the blind. It is felt that an enlightened work force can then render the socialization process of the blind into a rational and deliberate force for positive change.